Want to join our group of amazing volunteers? If you are not running the Fleet Half Marathon, why not play another vital role? The race could not go ahead without our amazing volunteers. You may be an injured runner or someone who used to run but cannot now or a member of the public wanting to support your community – we would like to hear from you. The Fleet Half Marathon is a race, organised by runners, for runners. The organising team are all volunteers and runners too. Charities and Community Groups – Raise funds! We have lots of local groups helping out e.g. managing the secure baggage area or water stations, helping on the finish line, doing “womble” patrols to make sure the event leaves no mess. In return the Fleet Half Marathon will make a donation to your charity or community group. This is an opportunity to raise awareness of your group with your branded flags and banners. We also welcome road-side entertainment, so let us know if you can supply a band, choir or group of cheerleaders! All of your volunteers will receive hi-vis jackets to mark them out for the day. Are you a local company who would like to raise awareness and support our event? As a race the Fleet Half Marathon like to work with local companies so we can bring real benefit to the local area. We know the day can bring some disruption to the town but if this can be off-set by providing local businesses with local opportunities to reach out to 3500 runners and their supporters, the benefit is kept within the town. Don’t be shy, email sponsorship@fleethalfmarathon.com to find out more on how your company can be part of this special day. All partners benefit from our website/Facebook/Twitter presence. We love to see local residents of Fleet and the surrounding villages out supporting the runners. It really does make a difference to the atmosphere and encourages the runners to achieve their goal. A half marathon distance (13.1 miles) is a challenge whatever your fitness. We print the runners names on their numbers so if you think someone needs some encouragement, call out their name, give them a cheer – it may make all the difference and help to keep them going. 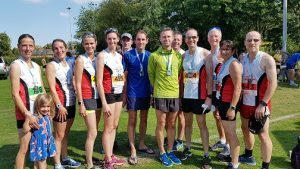 Feedback from the runners each year always mentions the crowds and support at the Fleet Half Marathon – it really is a very special race and that is why the runners come back. You do really make a difference. Why not put up some bunting or flags? If it is warm, feel free to offer “a shower” with your hose pipe. Add to the atmosphere by playing some music. Cheer on the runners and give them a wave – some will look really serious and in “race mode” whereas others will be laughing and smiling but they will all hear you. We know that it does cause some disruption and we do everything we can to minimise this but we do give lots of advance notice (via website, facebook, local media and road signage) so journeys can be planned etc. Thank you once again for your support on behalf of all of the runners and the organisers.